I did a ton of research before finally choosing the EOS 1P from Marmot. One of the main things I look for in a tent is free standing. The reason why I prefer free-standing tent is, I don’t backpack with Trekking Poles, and a lot of non-free standing tents rely on a trekking pole to stand up. The other reason why I like free-standing tents over non-free standing tents is that non-free standing usually needs to be staked in to stand up. Freestanding tents do not rely as heavily on stakes, and this opens up more possibilities for campsite locations. For example on a rock face, it's a little bit harder to set up a tent that needs stakes to stand up. There are ways, but it just inconvenient. Let us take a look at the EOS 1P, and I will go more into why I chose it along the way! 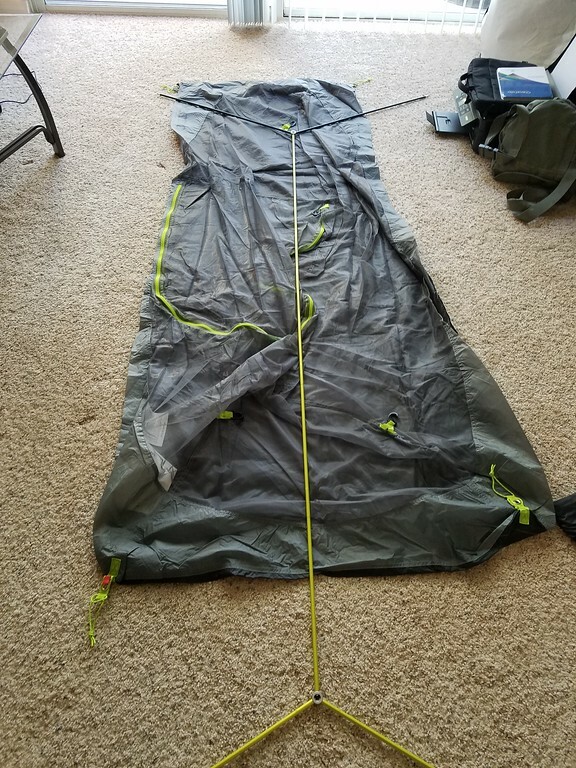 The first thing I noticed was, how lite this tent is, at 2 pounds 7oz, I was blown away. This is my first one person tent, and it is a lot lighter than my old two-person tent which was a massive 6 pounds. 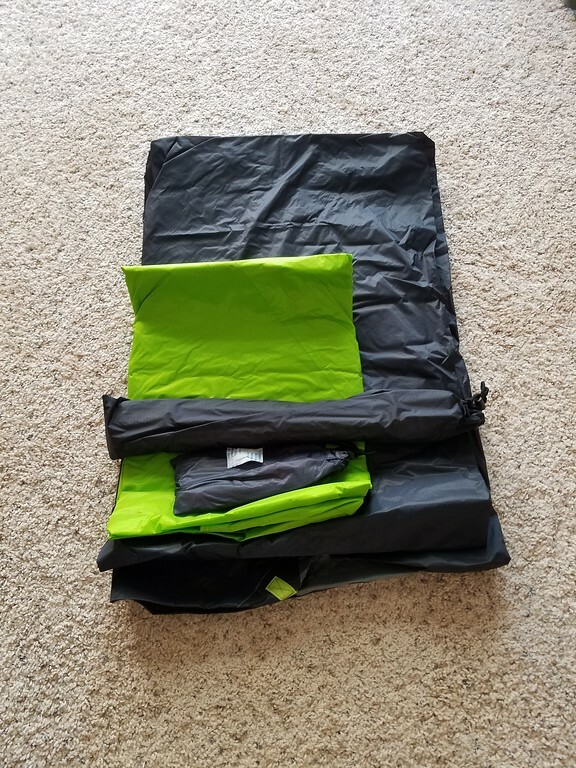 I ordered my tent from REI and got a great deal. I bought it at REI because I had just received my yearly dividend from them and it was a whopping $78!!! Basically, I shop there too much and living down the street from one is very dangerous to my bank account. Also, REI was having a 20% members discount sale, going on. 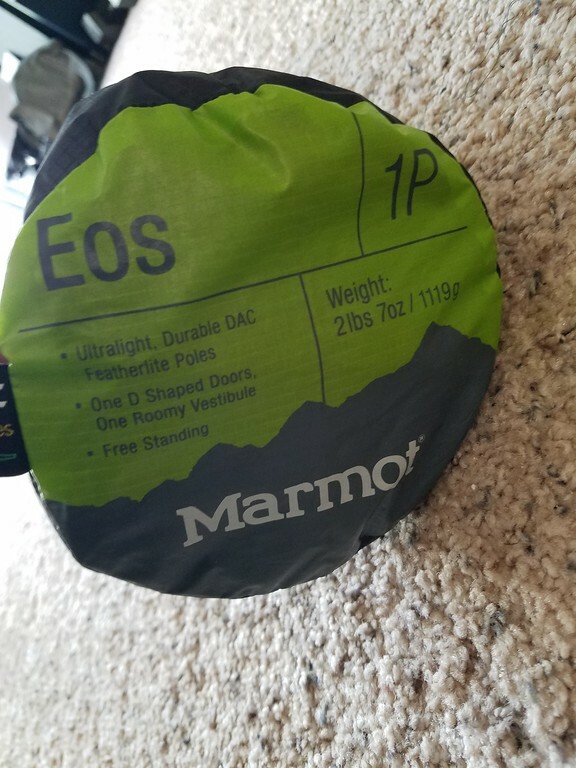 So I was able to buy the Marmot EOS 1P which usually retails for $249.00 for only $136 after my discount and REI dividend applied! I was pumped! Also, my tent arrived the day I was going out Jeep Camping with my friends so I would be able to test it right away. I still couldn’t wait to get to the desert to set it up, so I immediately threw it up in my apartment. As discussed earlier, I wanted a tent that was simple and quick to set up. 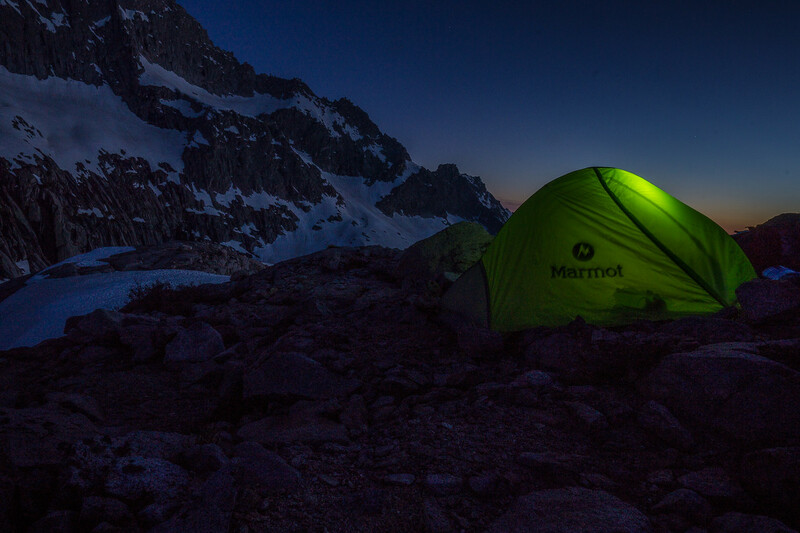 The Marmot EOS 1P comes with just a single tentpole, which is incredible. 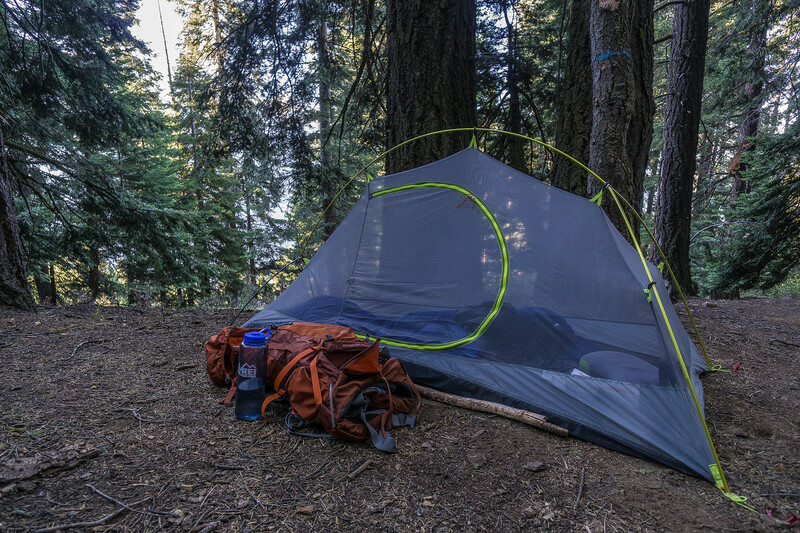 Simple and fewer things to break, this is one of my favorite features of this tent, and not many free-standing tents have a one pole design. The pole has a unique design, where it has two Y’s on either end, which help it be a free standing tent. 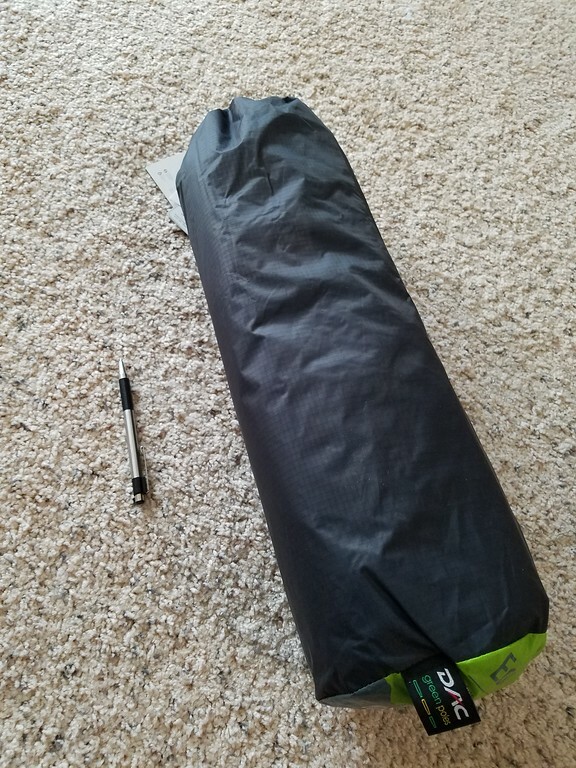 When I took the tent pole out of the bag, it pretty much came together itself and took two seconds to get ready. I know I said the tent has a single tent pole and looking at the picture above, you may think what the heck am I talking about. It is one pole though, all the pieces are connected with bungee cords down the center, so its one piece even when its collapsed down. The pole has one smaller Y and one larger Y at either end, which easily to match up with the thin end and the wider end of the tent. Like I said, no complicated setup, this thing is super simple. At the four corners, you easily snap the four points of the tent pole in then attach a couple of hooks and viola; the tent is up! 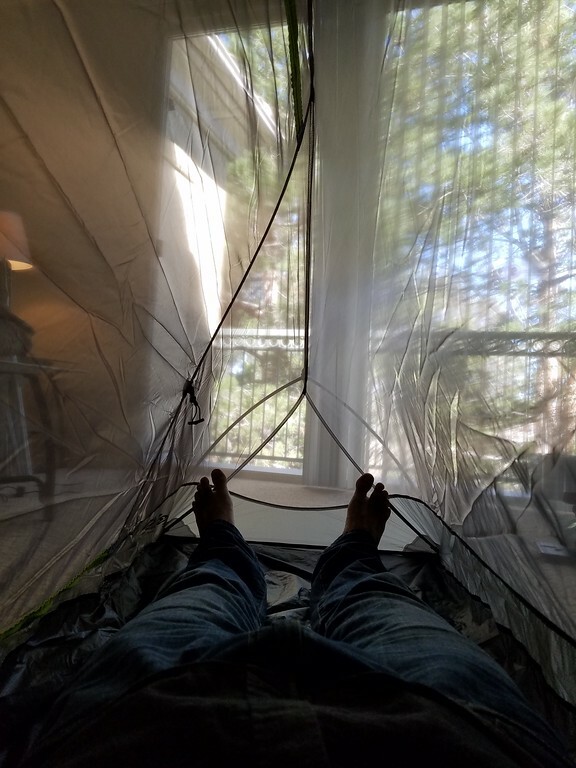 As you can see a free-standing tent can be set up anywhere, even in my apartment where I cant have tent stakes going through my carpet floor! Overall I was very pleased with the smooth and quick set up. After trying the tent out real quick, I quickly tore it down and threw it in my Jeep to spend a night under the stars in the California desert with my buddies. The ten set up just as quick in the desert, and I even through the rain fly on to see out it went up. The rain fly is just as easy to set up as the rest of the tent. 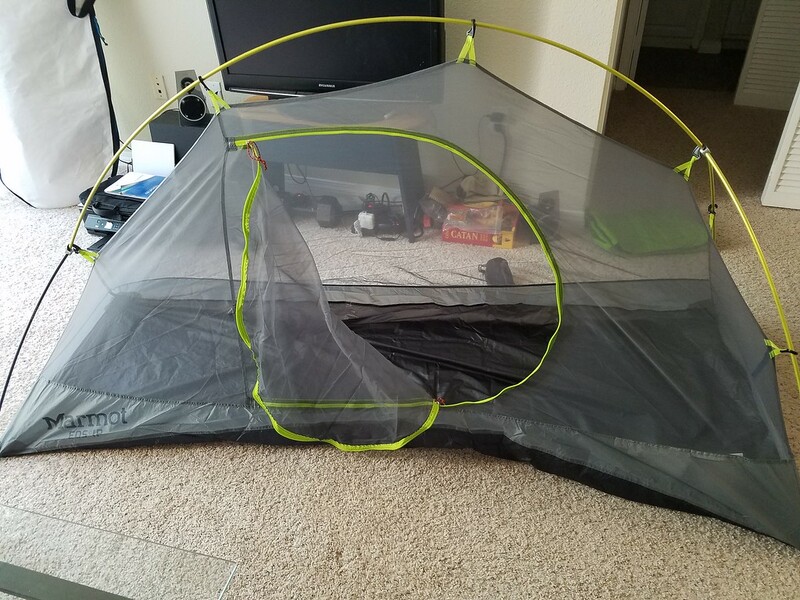 It has plastic hooks at each corner of the rain fly, and it clips to little loops on the tent. It went up in a jiff! 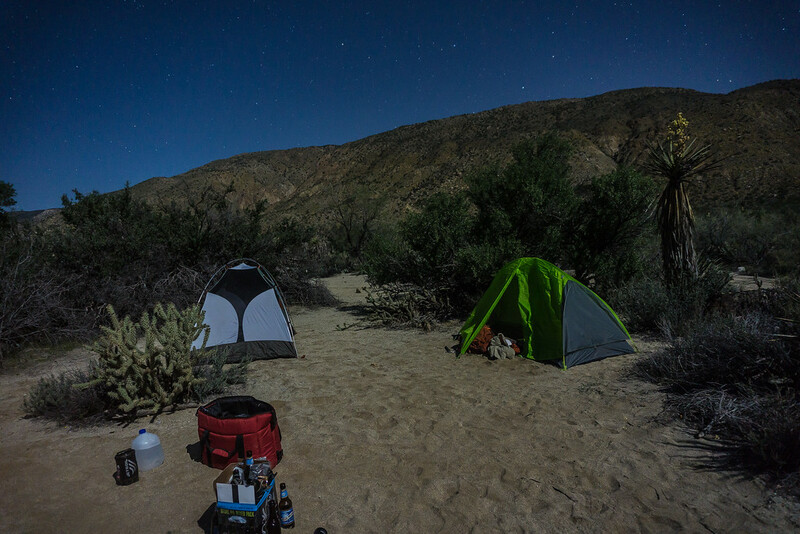 In the Anza Borrego desert, it was pretty warm, so I didn't leave the rain fly on, and I had a great nights sleep with some beautiful views! 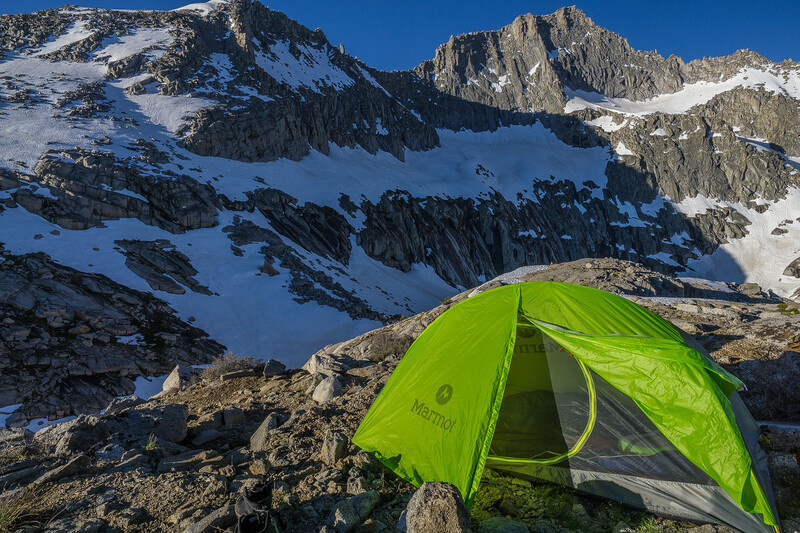 I next put this tent through its paces on a week-long 75 mile trip along the High Sierra Trail in the Sierra Nevada mountains. The tent held up great during the 75-mile trip, and I had it pitched in all sorts of locations from soft pine needled, to sharp rocks, snow, sandy lakes. I put this tent through its paces. The only issue I had was with a little bit of condensation while camping in between snow fields over 10k feet in altitude. It was our first day having to deal with snow, ice and elevation all at once and we didn't get to our pre-planned campsite. I was expecting a cold night on the edge of a mountain at 10k surrounded by snow, so I put on my rain fly. Basically, I was wrong, and it was surprisingly warm in my 15-degree bag. As a result, I built up a lot of moisture on the inside of my rainfly and got pretty wet waking up in the morning. I think if I left the door open on the fly all night this would have given me enough circulation to get the moisture out, and my site selection wasn't that good, but we were limited due to the terrain.